his video is about making home made Cookies. HAPPY MOTHERES DAY!! My black and white cookies,they are so easy to make and fun of great flavor!! ENJOY! !YUM YUM!!! In a large bowl, combine flour and baking powder. Mix well. In a mixer, cream together butter, sugar and eggs. Add milk, vanilla extract and mix well. Gradually add the flour mixture into the mixer and blend well. Spoon small portions of mixture on baking tray and pop into oven. Bake for 20-25 minutes at 375°F. Meanwhile, combine water with sugar in mixer and mix well. Mix half of the sugar mixture with melted chocolate in a bowl. 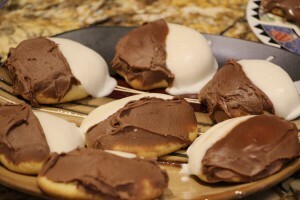 Top the cooled cookies with sugar mixture and chocolate mixture as shown in the video.